Though we got the chance to view the slew of Android Wear devices unveiled by Fossil at Baselworld earlier this year, we've now been treated to a more in-depth peek at the company's own Q Venture and Q Explorist at IFA 2017. The watches, which are slated to arrive next month, have been touted by Fossil as being the company's thinnest and sleekest Wear exports to date, and it's certainly true that the Q Venture is the most female-friendly, fully featured smartwatch to date. The 42mm curvaceous case is far better suited to slender wrists than any Fossil smartwatch that's gone before, ably abetted by a series of bling-studded and rose gold colours – and of course, leather straps and link bracelet options. At 11mm thick it's still ... plump, we'll say, sitting on the wrist with noticeable chunk, although the compact size means it still offers some comfort. Still, compared to its predecessor, the 45mm and 13.5mm thick Fossil Q Wander this is a real improvement, even if there's further to go. We've seen a significant push over the course of this year towards female-focused Android Wear smartwatches, with Tag Heuer looking to reduce the size of its Connected Modular 45 to 39.5mm, and DKNY, Tory Burch, Marc Jacobs, Alpina and more looking to woo women with hybrid models. But few have managed to condense a full-display smartwatch into such a sleek device, which makes the Fossil Q Venture worthy of tentative praise. After not being able to see the Q Venture in action in Basel, we were pleased to see Fossil officially remove the flat tyre dead spot that's been present in previous touchscreen devices. And though the action was still limited on the watch face, we can confirm its resolution looks stronger than the Q Marshall and Q Wander from 2016. On the male side of the coin, the Fossil Q Explorist shown above boasts a 44mm case, coming it at 12mm thick. Again, pretty chunky, and the design comes with some noticeable detail on the case, reminiscent of the Samsung Gear S3. There's no flat tyre, but we are able to verify promises of improved screen resolution. Fossil hasn't felt the need to break out cutting-edge tech on its smartwatches, favouring looks, style and customisation over winning head-to-head battles with Huawei and LG on fitness features, screen quality or advanced sensors. However, like Tag Heuer and Huawei, it's swerved Android Wear's alternative crown or bezel control. The crown acts as a button for summoning the menu, but it doesn't turn for enhanced app control. No, we don't know what manufacturers have against that feature, either. 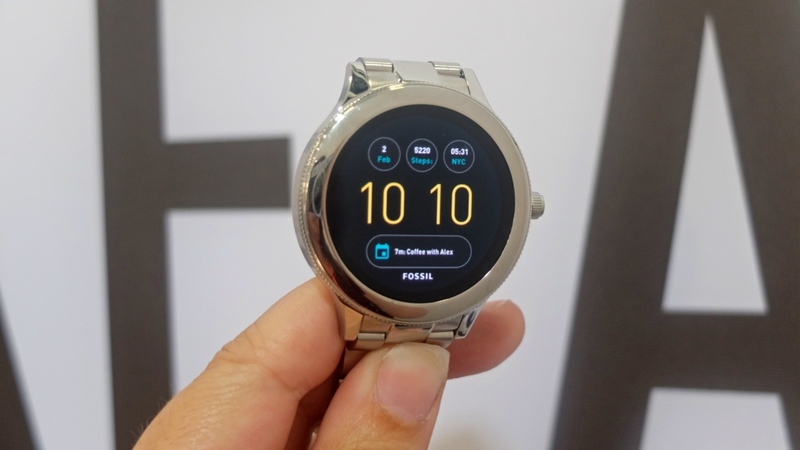 One of the focuses for Fossil Group brands embracing Android Wear 2.0 has been micro apps – brand-specific applets that make each device unique. While we know that Michael Kors will be using the My Social app and Diesel will be making use of gimmicky overlays through its T-ON-I app, Fossil is set to include a "vintage arcade game". Why? Who knows, but we like the sound of it. So while we've got a better look at what the Q Explorist and Q Venture will offer users looking to get involved with the Android Wear action later this year, we're still yet to see a fully fleshed out demo of the watches. What we can confirm, though, is much of what we assumed back in March: these are stylish devices that will be vast aesthetic improvements on the previous collection. Add to that the fun of Wear 2.0 and Fossil is sitting pretty. We'll update this piece with an in-depth review once we have our hands on the Fossil Q models next month, so stay tuned.